As a child, I loved spending time noticing things when I was outdoors. Poetry can help us do just that - observe the world around us, in small and intimate details. 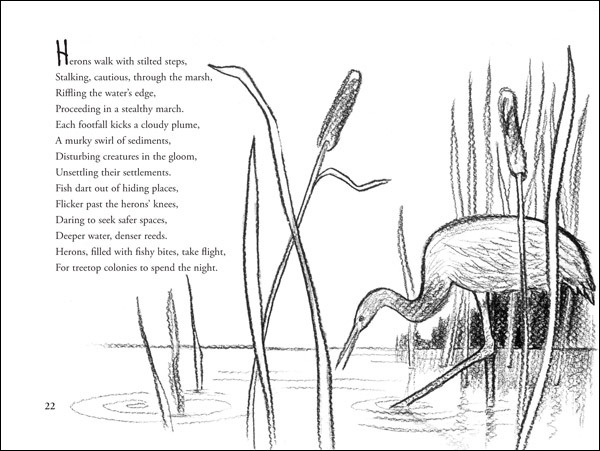 Susan Blackaby's new collection of poems, Nest, Nook and Cranny, is perfect for reading with your children and talking about what they notice, both in the poems and in nature all around them. Poetry can do more than help us notice the world around us: it can help us notice the words on a page. Susan Blackaby talks about the craft of her poems in the end of the book. While children may not be drawn to this discussion, I found it fascinating to think about how each poem was crafted. Parents and teachers can read this, mull it over, and sprinkle in their observations as they read these poems with children. My favorite poem is "Shallow pools in rocky ledges", perhaps because I have always been fascinated by tide pools. When the changing tide runs high. Parching when the tide goes out. For creatures in a tidepool, living conditions - either all wet or mostly dry - follow certain rules, but the transition period from one extreme to the other is marked by instability and chance. This poem follows a similar pattern. It begins at low tide with one rhyme scheme (ab cb), gets interrupted midway through when the tide comes in (an unrhymed couplet to suggest disorder), and ends at high tide with a different rhyme scheme (dd ee). 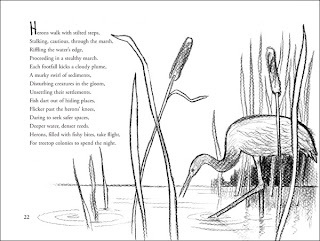 If you are looking to share poems about nature, or help children notice more details in the way poems are crafted, this is an excellent collection. During April, my goal is to review 10 poetry books for children as part of National Poetry Month. To find other great resources, check out Poetry Friday, hosted this week by Paper Tigers. The review copy was kindly sent by the author. The sections quoted are reprinted with the permission of Charlesbridge copyright © 2010. If you make a purchase on Amazon using the links on this site, a small percentage will go to Great Kid Books (at no cost to you). Thank you for your support. This sounds like a wonderful book to help guide children in using the wonders and observations for poetry. What a great mentor text. This does indeed sound a wonderful book - and it's great to have the poetic key a the end, as you say. I'll have to try and get hold of it... Thank you for your fullsome review. Does poetry speak to your teen?